ARKHANGELSK, March 22. /TASS/. About 45 experts on board the Mikhail Somov vessel will study conditions of the Arctic seas and will analyze climate changes in the Arctic at the second stage of the Trans Arctic 2019 expedition between May 15 and June 10, Head of the Northern Hydrometeorology and Environment Department Roman Yershov told TASS. One of the tasks under the Science National Project is to build up steadily the number of sea expeditions to 250 by 2024. The Trans Arctic expedition will have four stages. It will finish in autumn, 2019. The scientists will conduct complex studies of the Russian Arctic’s seas. Prime Minister Dmitry Medvedev inked an order to allocate almost 870 million rubles ($13 million) for the studies. "The expedition on board the Mikhail Somov will feature 45 scientists and 40 crew members," the expert said. 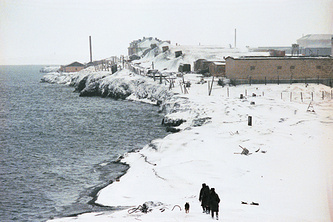 "The expedition is organized jointly by the Department, the Arctic and Antarctic Studies Institute, the Northern Arctic Federal University, the Typhoon Scientific and Production Association (in Obninsk), the Marine Heritage Association, the Central Aerology Observatory, the Severtsov Institute of Ecology and Evolution Studies, the Laverov Federal Research Center for the Arctic Complex Studies, and others." The main task is to monitor the marine and coastal ecosystems in the changing climate and to receive up-to-date information on the marine ecosystem’s conditions. The ship will depart from Arkhangelsk, to take the expedition to the White, Barents and Kara Seas. "The Mikhail Somov is ready for the set tasks, all necessary conditions are offered onboard: there will be labs and necessary equipment," he said, adding "the crew, of course, is ready." According to objectives of the Science National Project, by 2024 Russia should be among five leading countries in scientific research and works. The country should offer attractive conditions for work in Russia both for foreign experts and for young promising researchers. The country will build up financing for scientific research.